A training company was looking for a trainer capable of delivering Train the Trainer in Coaching as part of its Master Coaching programme in the Middle East. SCT were approached and agreed to deliver a public training course using simultaneous translation in Abu Dhabi and Dubai. 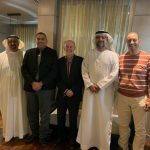 David Rigby delivered the training in both Abu Dhabi and Dubai with content based on the Arabic training manual and English translation copy. SCT training is dynamic and interactive with a focus on delegate participation, with a key component being practical application within the training days, giving the delegates a real experience of the coaching process. David based the coaching practice on the well-known and effective GROW model. This enabled ‘one step at a time’ learning and application. Recognising for example, that ‘Goals’ – the object of a coaching session, is not simply a 30 second listen but can take time and deep listening skills to identify what the goal really is, while also working with the client to make it SMART. Discussion was followed by practical experience, working in pairs and groups to develop real examples. This approach was mirrored to explore the other GROW components of Reality, Options and Will. David’s delivery enabled delegates to appreciate that coaching not only involves ‘going through the process’ but also is about the coach understanding their own role and building rapport and a trusting relationship with the client. He introduced concepts from different disciplines including NLP, Sensory Acuity, Beliefs and Values, Emotional Intelligence and Behavioural Preference Profiling, illustrating these with lots of practice. Group discussions explored beliefs and values, both of client and coach to enable deeper knowledge of differences between self and others; delegates gained an appreciation of how to deal with client beliefs which might differ from their own as coaches. The delegates had different needs, different backgrounds and different levels of knowledge about coaching. In addition there was a range of experience of the English language, both listening and speaking. David’s inclusive training approach balanced the individual delegate needs, ensuring maximum benefit to everyone. A key to success was David developing strong connections with the delegates. Working with simultaneous translation there can be inevitable delays and risks of mis-communication. The translator’s and trainer’s skill in observation in tone, body language and communication were essential, resulting in a varied, dynamic set of interactions, and importantly, a strong and positive learning experience for all. Those attending the training who had previous knowledge of coaching recognised that there was a lot more to it than they had previously been taught or had practiced; they found going back to fundamentals very beneficial to embed and improve their knowledge and skills. Those less experienced appreciated that this training was different from a standard prescriptive delivery; using role play based on their own scenarios and examples with a focus on specific aspects of coaching, in preference to a generalised approach, was valued as a great way to learn and a good tool to sustain focus. In addition delegates benefited from diving into the different disciplines, testing out approaches and listening to each other’s stories and the personal experiences of David as a coach. Being able to ‘read’ the client rather than just listening to the words used is crucial to successful coaching outcomes. Delegates learned to start a coaching relationship by increasing self-awareness and self-understanding so as to be able to adapt their approach to build better rapport with their clients, enhancing the coaching relationship.